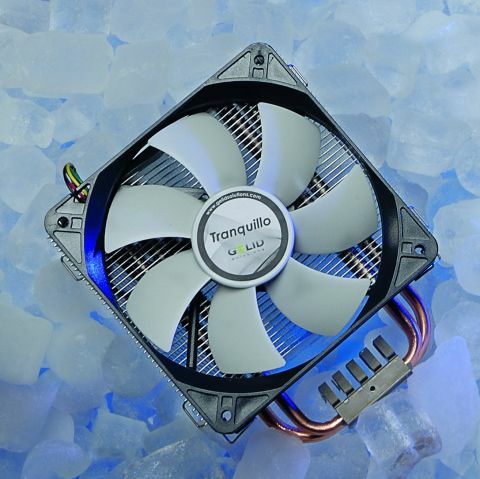 The Tranquillo is a big tower cooler with four 6mm heat pipes (without Direct Touch, though) and a fin stack which, for once, didn't feature blood-letting edges. It fits the usual suspects of AMD and Intel chips. You get a lot of hardware for your money here. Unlike Titan's Fenrir and Xigmatek's Thor's Hammer we're not in the world of heavy-metal casings. This is a workmanlike cooler without frills. There's a fair bit of hyperbole on the box about intelligent fans, high airflow and optimised fan blades (what are the rest using then?). The cooler's design is certainly very plain, but shows signs of some thought – there's a cheek piece on one side to deflect air away from your graphics card, for example. The fixings are of above average quality – heavy backplates and screws with nice big slots and knurled edges. You can even get at the main screw heads from directly above all round, which is more than most designs can manage. All this made fitting quick and easy, something to bear in mind if you are in the habit of removing your cooler now and again. Performance under full load lags a little behind the rivals, it ran at a whisker over 58 degrees at full load. At idle it managed 45 degrees. Rivals such as Titan's Fenrir can knock a few degrees off both these figures. The smaller heat pipes play a part here, perhaps. However, it's nothing to cause undue concern. These figures are good enough to enable you to start experimenting with overclocking with confidence. The price of the Tranquillo seals the deal. It's excellent value. Added to the no-nonsense design and superb Intel fittings and you have yourself a winner. It's not as flashy as many, but gets the job done at a bargain price.